What Should I Know About Insertional Achilles Tendonitis? →What Should I Know About Insertional Achilles Tendonitis? There may be many reasons why you are experiencing a painful Achilles tendon. If you have found yourself negative on the Achilles tendon rupture test, you may be suffering from insertional Achilles tendonitis. In this article, we will go into details about this condition, its symptoms, and possible treatments. What Is Insertional Achilles Tendonitis? Achilles Tendonitis is basically caused by the inflammation or irritation of the Achilles tendon. This tendon is the largest in the body and connects your calf muscles to your heel bone. It is the tendon that allows you to jump, stand on tiptoes and run. 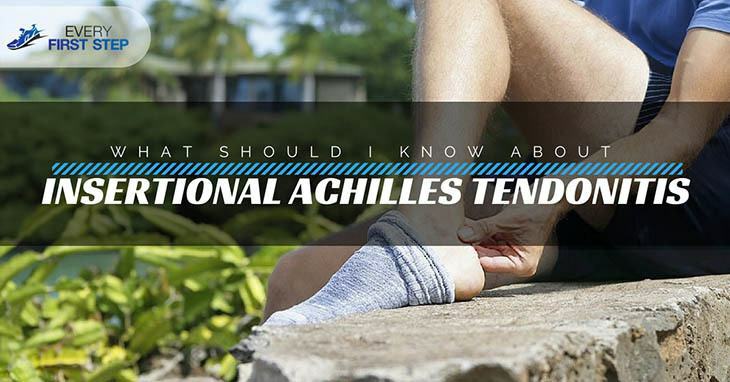 Insertional Achilles Tendonitis refers to the location of the inflammation which is at the lower part of the tendon where it connects to the heel. Noninsertional Achilles Tendonitis is located in the middle part of the tendon. In runners, however, it is most likely that the condition is caused by overuse. For example, changing training intensity, duration and distance can put too much pressure on the tendon while reducing the time it has for repair. Such overuse increases the rate of tissue degeneration causing the inflammation of the tendon. If you experience a "pop" and then a sudden pain, it is likely you have a ruptured Achilles tendon, not Tendonitis. To properly diagnose the condition, a doctor may examine the pain and swelling in your heel or calf. Imaging tests including x-rays, MRI scans or Ultrasounds may be prescribed to confirm the condition. Recovery from Insertional Achilles Tendonitis may take 10-12 weeks before you will be able to return to running but this is if you follow a strict recovery routine. ​Wearing best shoes for achilles tendonitis which usually have a heel. Braces, night splints, and arch supports can also help. Physical therapy is another good way to help reduce the symptoms. Isometric exercises such as the heel cord stretch and calf raise can be performed to maintain strength and reduce pain. Achilles tendon massage may also be used to help manage pain and inflammation while maintaining mobility. Anti-inflammatory drugs can also be useful to reduce swelling but always get a prescription from your physician before deciding to take anything. ​An upgrade to the exercise is the Bent Knee Eccentric Heel drop where you bend the working leg slightly and put your body weight on the injured leg. Insertional Achilles Tendonitis may be a difficult injury to treat and may take time to heal but it does not mean the end of your running. With a proper understanding of the condition, strict adherence to treatment methods, you can be on your feet in no time. Do you suffer from Achilles Tendonitis? How long did it take for you to run again? Any other suggestions you would like to share? Please let us know in the comments below. How To Get Rid Of A Lump On Ankle At Home ?